Can You Spray Paint a Food Truck... And Actually Make it Look Good? Can You Spray Paint a Food Truck… And Actually Make it Look Good? Thinking about painting your food truck? Most gourmet food trucks on the road today use a vinyl wrap to achieve that glossy, professional looking exterior finish. As a general rule of thumb we recommend using a food truck wrap instead of paint as well. Why? The reason is that when apply a vinyl wrap, you can be confident about getting exact mobile signage that you envisioned for your business. With a food truck wrap the colors, logos, and fonts are designed on a computer program first, printed out, then applied to your truck. This makes the process extremely precise and requires less skill from the installer. Bottom line, you’ll get more consistent results by going with a wrap and lower price overall. You can learn more about the process and view a checklist for getting food truck wrapped right here. From a design and application standpoint, a vinyl wrap will be easier and faster to produce. If you plan to hire an artist to create your food trucks exterior look, you’ll want to be sure they’ve got years of experience mastering their craft. Someone that installs a wrap, however, can be adequately trained and certified within week because the process of applying a wrap requires much less skill. No matter whether you choose to go with a spray paint or wrap, you need to understand how important an external perception is on a food truck. If your truck doesn’t look clean and attractive on the outside, most people won’t even give your truck a try. Chris Kaye, owner of The Atacolypse Food Truck in Erie, Penn., operated his food truck without a wrap for the first couple of months while bootstrapping his business. “I went and had it wrapped and we immediately doubled our followers (on Facebook).” Kaye also noted that he received more calls for catering and local events after the wrap was installed. If you’re serious about being a successful food truck, you’ve got to pay attention to your businesses first impression. This means whether you decide to go with a wrap or paint, it’s got to look clean, professional, and inviting. Okay, so maybe you’ve read out words of warning, but you still want to paint your food truck. That’s totally cool! If completed by a true artisan that can bring your vision to life and has mastered their craft you can end up with a beautifully painted food truck that will truly differentiate your business. 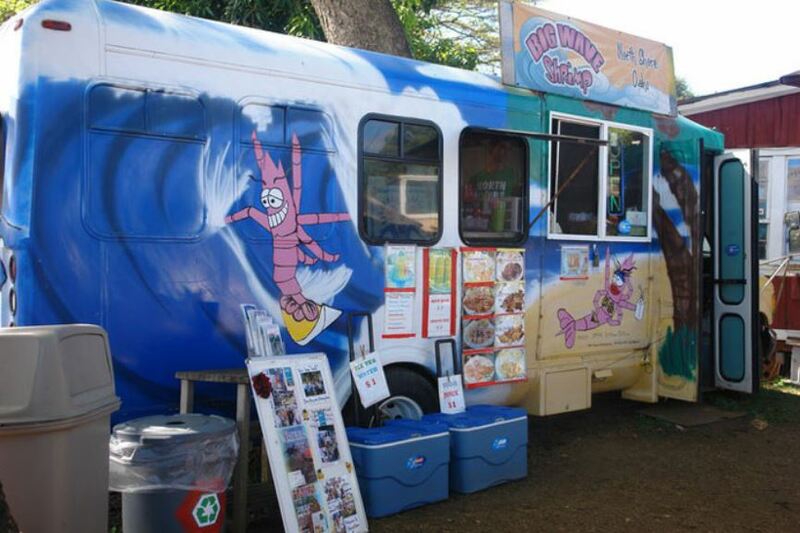 An excellent real-life example of this is from The Big Wave Shrimp food truck located in Oahu, Hawaii. This mobile mural was created by a truly talented artist Chad Thurman and his team. Check out the video below to watch the entire truck being spray painted with a time lapse. As you can see in the 2 and a half minute video, there’s a high-level of skill and experience needed to pull off this type of a paint job. This process of painting is also called a bomb or tag the vehicle. The waves need to be shaded correctly, the detail of the shrimp needs to be colored just right. If a novice tried to pull this off… the truck could end up looking pretty bad. Fortunately, Thurman’s team made the unit totally unique and reflect the overall vibe of the business. Another example of impeccably hand-painted food truck is in Kansas City, called Wilma’s Good Food. Wilma’s Good Food serves up a variety of comfort food dishes the KC-area including poutine, gourmet mac and cheese, fried grits, and trademark Red Neck Rolls (Spam and Velveeta sushi roll with spicy hibachi sauce). The truck’s exterior is as funky as the food cooked up inside the unit. Watch the video below to see the process of hand-painting this trailer. Wilma’s Good Food was painted by an eclectic band of Kansas City artists Lucid Arts and Sike Style. As a result of their efforts, they’ve been able to produce a truly unique looking mobile kitchen. As with any form of art there’s a certain level of personal preference with what looks good vs bad. Some people love the rock band Journey. Some folks think “Don’t Stop Believing” is a terrible song. Both groups of people hear the exact same song and notes, but come to a totally different conclusion on the quality of music based on personal taste. As a result, you’ll need to find an artist or painter whose past work aligns with something that looks good in your opinion. One way that you can find the right artist for your future food truck mural is to look at the individuals past body work. While many artists won’t have a lot of experience painting vehicles (that’s a pretty narrow niche), they’ve likely completed other projects that will give you a sense of their style and approach to a piece of work. Some artists may have experience developing billboards, exterior signage for restaurants, or even painting beautiful pictures. The first step is to identify if you like the artists style as they will likely create something with a similar vibe. If you don’t think their past work matches the theme of your business, continue your search. At the end of the day, you can paint a food truck and have it look outstanding. But it’s going to be more time-consuming and in many cases more expensive to hire someone to hand-paint your unit. If you are planning to get a very basic external paint, you may only need to invest $500 – $2,000 into your project. However, due to the creativity, skill, and time needed to create these rolling pieces of art referenced in this post, the cost will be considerably more. Paying $5,000 – $10,000 or more for this type of project should be expected. While a painted food truck can help you stand out there are some branding basics we recommend implementing for your truck regardless of choice of your exterior. Name: This may seem obvious, but it can be overlooked by some designers that the business name of your truck should be included on prominently on the unit. This will help new customers identify your truck by name and help you drive more revenue. Contact Information: Anytime you’re commuting with a food truck, it’s an opportunity to make new connections. People can’t help to take notice when a food truck is in transit. For this reason we recommend including the telephone number and website URL. You may be surprised at the catering opportunities that come your way by taking advantage of this simple marketing tactic. Bright and Inviting Colors: Finally, the use of bright and inviting colors is strongly suggested. Not only will these help you stand out from the crowd of food truck in your area, but it will invite customers into your truck to see what you serve. In conclusion, if you want a totally unique looking food truck using paint is a viable option. But you will need to take additional care to make sure you find the right person for the job. If you are able to find an artist in your someone in your area that can accomplish this project, the extra work and expense can definitely pay off as the result will be a truly one-of-a-kind concession truck. Food Blogging Topic Ideas That People Actually Want to Read and Share.